Caruso is a long-serving member of the USC community, an alumnus (Bachelor of Science, 1980), a current parent, and member of the Board. He is the founder and CEO of Caruso, one of the country’s largest privately-held real estate companies. Born and raised in Los Angeles, Caruso is a renowned real-estate developer, civic leader, and philanthropist who has earned a reputation as a dedicated citizen and a compassionate yet tough leader. He has a record of success bringing needed reform to established institutions. Caruso served as the youngest commissioner in the city’s history when Mayor Tom Bradley appointed him to the Board of the LA Department of Water and Power. In that role, he brought a 25-year-old lawsuit to a resolution that provided more clean water to Los Angeles and protected the environment. In his subsequent role as President of the Los Angeles Police Commission, Caruso led the effort to overhaul the LAPD’s disciplinary procedures and recruited William Bratton as Chief of Police. Together, they reduced crime rates to historic lows. At USC, they endowed the USC Caruso Department of Otolaryngology at the Keck School of Medicine, and the USC Caruso Catholic Center, which provides spiritual connection for faculty and students of all faiths. 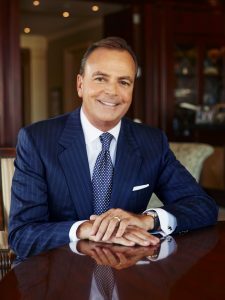 Caruso earned his Bachelor of Science degree from USC Marshall School of Business and his Juris Doctorate as a Margaret Martin Block Scholar from Pepperdine School of Law.